This Much I Know about Love Over Fear is an authentic personal narrative of teaching, leadership and discovering what really matters. It gets to the heart of what is valuable in education and offers advice for those working in schools. John Tomsett has been a teacher since 1988 and a head teacher since 2003. He is head teacher at Huntington School, York. Tomsett writes a blog called “This much I know … ” and is a regular contributor to the TES. He co-founded The Headteachers’ Roundtable think tank and is a popular speaker on school leadership. He is determined to remain a classroom teacher, despite the demands of headship, and believes that developing truly great teaching is the main responsibility of all head teachers. This book surprised me. I know John-the leader but 'This Much I Know about Love Over Fear' is definitely written by John - the teacher. Whether you are an NQT or have been a head teacher for years you must read this book. It will inspire you, challenge you and make you smile. 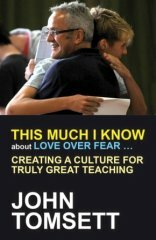 John is the template for the 21st century head teacher that I aspire to be - 'This Much I Know about Love Over Fear' should be on every teacher's wish list. For me, John Tomsett represents the soul of education, always keeping what matters most at the centre of everything he says and does: great teaching and moral purpose. This Much I Know about Love Over Fear captures that spirit perfectly: personal history, golf, poetry and educational wisdom grounded in experience combine beautifully to create a book that is both practical and profound. John Tomsett is a very rare kind of head teacher, and it's no surprise he's written a book that's equally rare, in that it is a book written by someone currently within the education system, about the education system, that is both apposite and well written. He writes with conviction and experience, both of which are necessary to say anything useful in a crowded field of books that are anodyne, vacuous or thinly-disguised polemics. I began teaching in secondary school in 1973 and retired only recently to become a learning analyst/consultant and I can confidently say this is easily the best book I've read by a Head teacher. I feel ALL Head teachers, in fact ALL teachers should read this book and would benefit greatly from it. John's background as an English teacher has helped him to become an excellent writer (sadly I can't claim the same) which makes it an enjoyable book to read. Although he only began teaching in 1987, he demonstrates that if you are an effective learner and seize the wonderful learning opportunities as a teacher you can become very effective and enjoy it. However, most importantly his learning from experience and awareness of Stephen Covey, W. Edwards Deming, Carol Dweck, Jim Collins, John Hattie means he has learnt to become an excellent Head teacher. Truly inspirational. If I were a headteacher I would want all leaders in my school to read this book. A moving and inspiring read; a must-read for school leaders. I thoroughly enjoyed the conversational style of this book. His writing about the things that have shaped his teaching career are honest, humbling and, for me, inspirational. An must for anyone in education. Fantastic book. Inspirational, compelling and practical. An essential read for anyone who works in or with schools.